As November draws to a close, and December opens its arms to the merriment of season greetings, the start of winter, Christmas, any other holiday that you might celebrate, it’s time to talk about what to get that writing friend that is on your list. Yes, we writers like to have gifts that are essential to our writing goals or wishes. This is also how you prove that you are supporting their goals in life by giving something that will help them with their writing. So without further ado, here is this year’s Christmas list of what to get your writing friends. Let me also preface this as I did this same post last year, so if you need ideas you can also check out that post. Here is the link to last year: Need help shopping for the writer you know? Let’s start with the kids that have an interest in writing. If the child that you know is interested in writing, give them a notebook or a journal along with a nice pen or pencils so that they can start using these tools to build their arsenal. Granted, this is the same suggestion as last year, but it’s always going to be a goto one at any rate. However, this year I’m also going to let you know who you can make it better. If there is a certain character that they like and they cannot find a notebook with that character plastered all over the front of the notebook, I would suggest check out Vista Print and make a personalized notebook with the said character on it. This way they have something unique that they will cherish and love. You can also do this same idea with Staples, or Office Max. Now let’s talk teens and preteens that love the art of writing. Again I’m going to the notebook suggestion. You can never go wrong with a notebook or a set of really awesome pens or pencils. If they are into technology and already have a laptop, might I suggest that you purchase for them a licensed copy of Scrivener, or Microsoft Word that way they have a writing software at their lovely fingertips. The other gift that you can give them is a larger monitor with the capability to do HDMI, this way they can look at the bigger screen instead of depending on that tiny little screen. You are not only helping their writing but their eyes also. The other suggestion is a nice keyboard and mouse set so that way their fingers have more room to move than being confined to that keyboard. Also on the licensing note, you can also give the gift of Adobe Photoshop. Yes, this gift can be helpful to the self-published author when it comes time to put together the book or if they are having someone else do it for them, then help with the deposit. But if they are like me and want to take full control of how that book looks and feels, Photoshop is not a bad investment for their writing career. Now for the college-aged kids, same suggestions as above and you can never go wrong with Microsoft Word, for they are going to need it for writing those lovely papers. But let’s get into some other useful things that they can use. Planners are big. I mean really big, for there are whole sections now in craft stores just dedicated to the art of making a really awesome planner. If your college-age student is really into detail planning, you can not go wrong by giving them a planner and some of the different options for customizing that planner to suit their needs. Granted, the planner gift can also be a good one for those teens and preteens that are on your list. Now let’s talk about writing guides as gifts. There are several that have come out this year and there a few that have been around that I have picked up this past year. However, I’m going to say one that every fiction writing is getting and it makes this year top ticket item for writers: Save the Cat! Writes a Novel: The Last Book on Novel Writing You’ll Ever Need, by Jessica Brody. Save the Cat! books were originally written for screenwriters and someone has taken the formula and made it accessible for fiction writers. Granted, Save the Cat! has always been a go-to guide for any writer, but now we have one for just as fiction writers. Let me tell you, this is going to make a great Christmas gift, for it will come in handy. Let’s get into the adult writers in your life, this list can be quite endless for anything is possible, and I mean anything. Notebooks, journals, technology, writing guides, and planners are going to be on the list for any writer. However, on my own personal take, think outside of the box. Really outside of the box. If your writer friend is a coffee drinker, while they write get them either a really nice mug or get a personalized mug from Vista Print, that has a quote about writing on it. Granted, you cannot go wrong with a candle or incense, for most writers like to write with a candle melting in the background. I would also suggest music that will help them relax when the writing can be a little bit too much. Another handy gift, to give this season to your writing friends is a cork board, this way your writer friends can tack on their writing notes just above their writing area so that they can look up and find notes if they need it. Trust me, some writers can never have too much cork boards even if they have one. Granted, if you really want to go out on a limb, a nice Tarot deck can be a good tool that writers can have in their arsenal. A deck and show images that can help inspire writers to unleash that creativity that they have built inside and is just waiting to come out. Granted there are so many decks out there and my suggestion would be to pick one that you believe speaks to them and not to you. Unless you want a deck for yourself and that is never a bad idea either. On that note, I hope that you have a Happy Holidays and have fun shopping for that writer friend that is on your list! 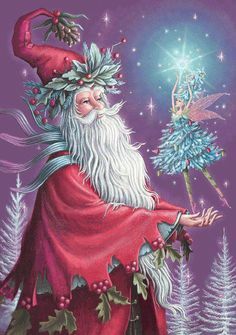 From all of us at Moonspinner3 Books, Faerie Rose Press, and Elderwood Publications, Happy Holidays! I can’t believe that November is almost over, like in two days. This month has been extremely busy with NaNoWriMo, getting ready for Thanksgiving, and of course may the shopping season begin. 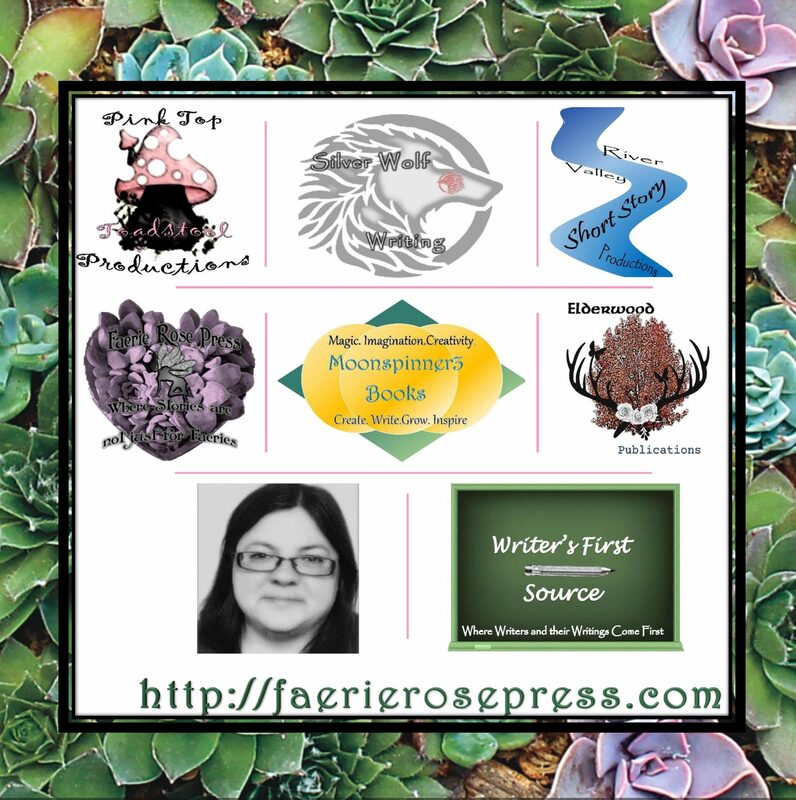 In the mean time, there are still things happening right here at Faerie Rose Press, this includes making plans for next year. Yes, 2018 is almost over and 2019 will be coming soon upon us. Before, we get to what is in store for next year, let me get into what has been going on this past month. Let’s start with NaNoWriMo. This month, I started work on the first draft of The Bird that Sings. This draft is going so well, that I’m still working on it. Let me define this statement by saying that while I didn’t reach the goal of 50 thousand words, I did however, get to a point in the draft where I’m going to stay that it is a work in progress. Yes, it will be put on the shelf of projects to be worked on but it will not be so far on the shelf that it gets ignored. There are other children that have asked for my undivided attention. One of those children is Ravages of Time. Let me preview this conversation about Ravages of Time with it’s in the plan for next year. However, about Ravages of Time, while it quietly sat on the table going, “Hello over here have you forgotten about?” The answer is now, I have not forgotten about Ravages of Time, not per say, it is just that other projects came along that gained me attention, such as The Bird that Sings and The Raven Prophecy to name a few. This can be a real problem having so many writing projects sitting on the shelves calling out for attention. That as part of next year’s plan, I really plan on working one project a time and seeing it through. This is where Ravages of Time comes in. While The Raven Prophecy has been a work in progress for the last fifteen years, I feel that since Ravages of Time has been calling out the loudest to me, I thought that I would see to it’s final stages. This means getting a second draft written, and hopefully get it published next year. This cover still has the house being the center point, and the clocks are really taken a back stage. When you look at the cover, it gives the impression of a picture frame around the house. I have changed the colors on the house to give it a more older feeling. Of of my goals this year is give more of a story vibe when I describe how things have come to me, as far as writing projects, as well as the covers that I make for my work. In the past, on this site, I have posted up a new cover without going into detail which on my part is bad. As writers we should be story tellers, and on this I want to work on this piece of what I want to convey on this site, which means telling the story. Therefore, let me give you the story of how this version of the cover came to be. I was driving in my car at night, through Longmont, Colorado when out of nowhere Ravages of Time called into my brain. I had the previous cover in mind, but then something was like wait a minute, it can use a different cover. Granted, the funny thing that came first to me was the clocks, such as the clocks were going to be used as border around the image of the house. Therefore, the second thing that came to mind was the house, which is so funny for when I first made the cover for Ravages of Time, the house was the first thing to come to mind. However, that was not he case this time, for it was the clocks. However, when the image of the house came to mind, I wanted to make it look older and more worn down then the previous versions. However, I was like that’s perfect, but instead of going to my computer straight away to work on it. I sat with this image in my head for a week. Yes, this image was coming to me for a whole week, when I was intensely working on The Bird that Sings. Then last Saturday, I had enough of this image coming to me and being like: Hey, I gave you a fricking gift what are you going to do with it? Therefore, I sat with my computer and I worked and configured with cover for four hours. Yes, that’s right, four hours! Let me just say that it was the best four hours that I have spent working on this cover, that is not to say that I rushed the previous covers but this cover I wanted it done right. I didn’t want it rushed. I wanted to take my time to work on it and to make it as perfect as I could possibly make it. Granted, I have been sitting on it for the last few days keeping it to myself, but I guess that is also my proactive as a writer and as a creator. I can keep things to myself until I’m ready to send it out into the world. Therefore, next month one of my goals is to start the ground work of getting my area completely ready to work on Ravages of Time. Yes, while others take December to recoup from NaNoWriMo and gear up for the holidays, I’m going to be digging deep into Ravages of Time. This of course is my decision. Part of it is also that it can get the attention that it feels that it deserves and oh will it get it. On a final note, I want to thank everyone is currently following this site. Let me announce that currently, there is a 120 followers and growing. Thank you, thank you to everyone that has followed this site, for your support means the world to me. Also I want to say, that in the month of December, I will be posting new content as well as my list of Top Ten gifts for Writers, which is a continuation from last year’s post on, Christmas gifts for your writer friends. That is all that I currently have to say in this update post. I hope that you all of a great writing day! Happy creating! Yesterday, the news broke of the passing of Stan Lee, 95, the creator of the Marvel Universe. 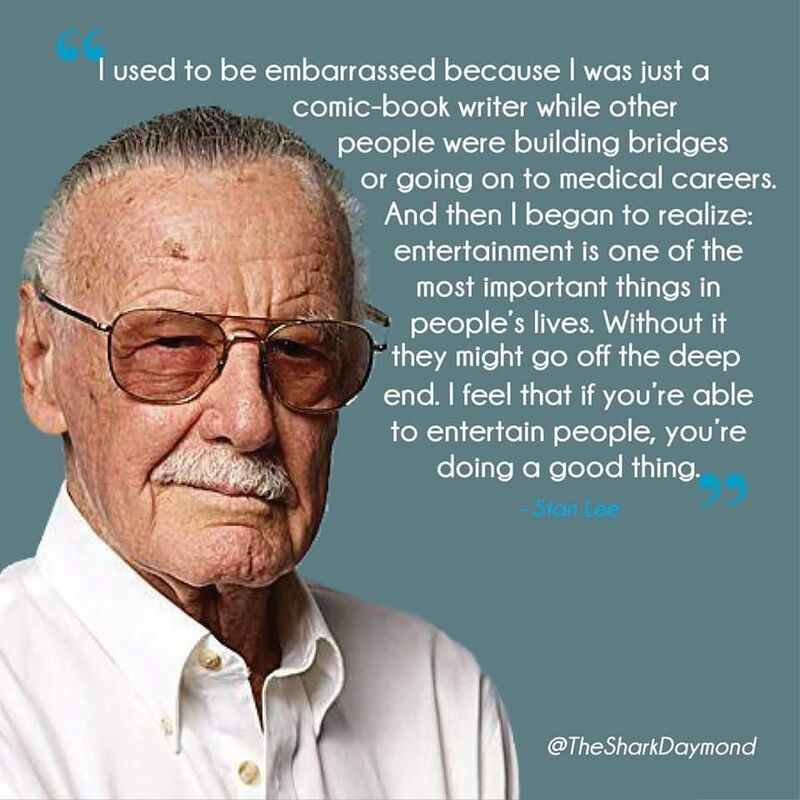 Even if you have not read any of the comic books, you should know of the many characters that he created such as Spider Man, The Incredible Hulk, Iron Man, The Black Panther, the X-men, and The Avengers to name a few in a long line of characters. 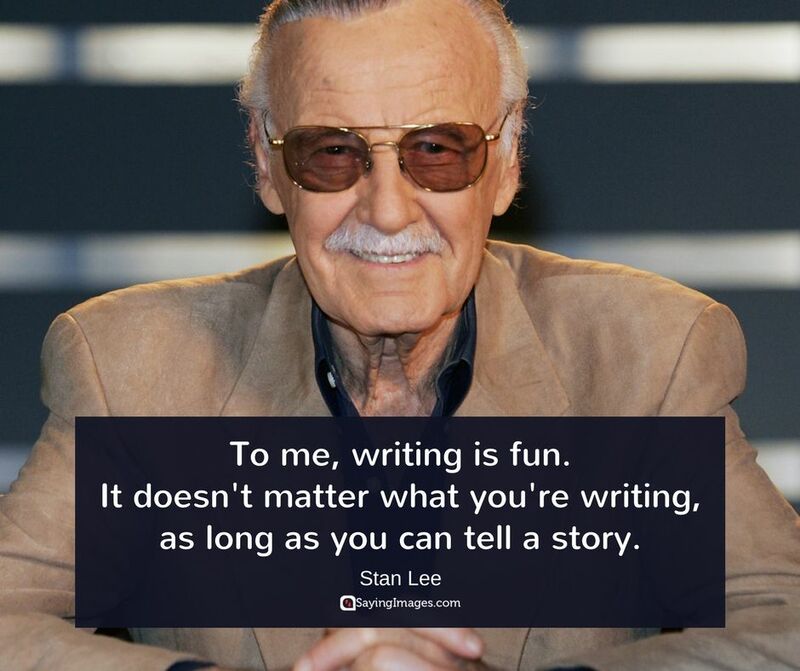 He was more than just a creator of legendary super heroes that domed the pages of comic books, he was a writer. A comic book writer, which at times made him feel embarrassed. Given by this quote, anyone who read his would say there is no need to be embarrassed. Stan Lee, you will be greatly missed! It’s day eight on NaNoWriMo, which means we have been participating in NaNoWriMo for a whole week. Yes, a week of this writing exercise is gone. In case you were wondering, The Bird that Sings is currently at 14,048 words or roughly nineteen pages. On the other note, here is a clever riddle to stroke your fancy: Why do pilgrim’s pants always fall down? Stay tune for the answer. However, speaking of NaNoWriMo, I want to talk about what NaNoWriMo means for me. During November it is reserved for us writers or authors to try our hand at writing a first draft of a novel. While this is the case for most in that they work on a novel that they have had on mind for awhile and have had the secret desire to get it out onto the page. While tend to play it safe with what they are comfortable writing what they have written before, in terms of genre and POV. I, on the other hand, tend to look at NaNoWriMo as a chance to experiment. Take myself out of the norm of what I typically write. This includes going from POV of third person narrative to first person. Further, while I enjoy writing fantasy, I usually use NaNoWriMo to tackle other genres that I have not written before. This gives me a chance to not only experiment but also a chance for, as I feel on the matter, growth. We as writers all need to let ourselves that chance to grow with our writing. Let’s face it if you don’t grow then you cannot improve yourself. While growth maybe one of the core values that I have in stowed with Moonspinner3 Books. But it is true, we all need to have that little hint that we are growing and maturing as a writer. This even goes for those that write children’s books and young adult. While our subject matter cannot show the maturity that we want to convey due to the limitations of subject matter, but we can hide secret meanings between lines of text. Granted, while our young readers may not see the light bulb being turned on, but our older readers may. Remember we also want to be clever with what we put on the page. Therefore, I tend to think of NaNoWriMo as my chance to be clever and to grow. Then what I gained during NaNoWriMo, I can carry forth to my other works in progress and to future works. Think back to that riddle at the top, Why do pilgrim’s pants always fall down? Granted, its not like the riddle of why is a raven like a writing desk? But the answer to the posted riddle is clever. Before I give you the answer, think of what a pilgrim looks like. You have that picture in mind. Here is the answer: They have belt buckles on their hats, overcoats and on their shoes, but not on their pants. Therefore, in short NaNoWriMo is an opportunity that we have been given to grow our use of words and our abilities to write and share stories. There is a reason why, the slogan for NaNoWriMo, is the world needs your story. This is true but the only way that we feel comfortable sharing our stories is through the process of seeing the growth in our storytelling skills. Its just up to those that dare to try to change their course through the opportunities that are given to us. This does not mean at this point that you should change what or how you writing your novel that you have already started this month. It simply means try something new the next time that you are writing a new project, rewriting your novel, or even editing the novel that is in progress. I would never want you to change what you have written based on the advice that has been given in this post. I hope that you all have a great writing day! Good luck during NaNoWriMo! Finally, happy creating! It’s day six of NaNoWriMo! How is your novel going? I hope that you are enjoying your time during NaNoWriMo. In case you are wondering, The Bird that Sings is currently at 13,034 words or at about 18 pages. I am still feeling pumped and ready to write my words and get them loaded on to the pages. Nothing is more refreshing then writing and using words that we have been given. However, we as writers use what we have always been given. Granted, there has never been a question of will we ever using writing in our live unlike math. We all remember those days, right? Asking our teachers and parents, what good is algebra? Or the famous one, when am I going to ever use algebra in my life? Yup, I can’t think of time when I’m ever going to use it. But writing is for life. Writing is what holds us writers together. It grounds us and gives us a strength like some have never seen or only can dream of. Writing for us writers, is like the force that is described in Star Wars. Many things can influence our writing as can the force. While the force has its teachings, so does writing. But where we are not confined to either being a Jedi or a sith, writers are confined by genre and sometimes, sub-genre. Genre can give us a direction, a feeling, a type of strength and sometimes a type of weakness in what or how we are writing. While others can say that there are limitations to writing to a genre, I would agree but I would also say that those limitations is what gets us readers and a fellowship. Not a follow ship but a fellowship. While we want to have our reader follow us for that is how we know that gained their trust, but we also want a fellowship. A fellowship among others in the writing community. The writing community is large and has many different angles. Some that are not best selling lists for months or even years to come. But there are those that want to help and mentor other writers. When writers come together and really help, then the fellowship is a success. Even if authors that we ready may not know that they are helping us, but somewhere deep down they should know that they are helping writers every time they publish a book. Let’s face it we writers as some point, and continue to be looked at as readers. Readers can turn into either greater readers or they can turn down the path that others have took to become writers. This is who the cycle of influence can continue. Granted, also think when we write and publish and someone reads our books, then we too are influencing those that could be future writers. Now matter where your writing journey goes, in your acknowledgments somewhere thank fellow authors for influencing your journey on being a writer, let alone taking that first step to write. Even it was or was not during NaNoWriMo. That is how I view the power of writing. I may be wrong or I may be right, but this is what makes the writing community stronger as a whole. I hope that you have enjoyed reading this post on my takes on the power of writing. I hope that you all have a great writing day! I wish you all continued success on your NaNoWriMo journey! Happy creating! Can you believe that we are on day five of NaNoWriMo? I know the writing is sure flying. I’m currently at 10,830 words or about 15 pages. That is where The Bird that Sings currently sits as of yesterday. Enough about NaNoWriMo for a moment. Let us put our hair out and let’s have some fun. Everyone once a while during the lure that is NaNoWriMo, you must also take time to take our of yourself. I know how can I say that when tomorrow in the United States we have Election Day? Well, it is quite easy. While there are various elections being run across the United States, the results will probably either come out tomorrow or it will take a couple days. However, it takes a while for those results to take effect such as January 1, 2019. There I said, changes will not take place over night. So for once let’s let it out. Let’s have some meaningful fun. No, I don’t mean go hog while and paint the town red. But rather, if you need to take a moment to get focused, you can write a letter. Not just any letter, but a letter addressed to your novel. You heard write, a letter to your novel. I ran across this exercise a while back and I have tried it once. The first thing that this exercise does is it allows to you address your thoughts on what your goals are for this novel. The second thing that this letter allows you do is to jot down your ideas on what is going to happen. This is an outline, but rather a free write type of exercise. This allows you to just write down whatever you want. Just make sure that you are addressing it your novel and that you are allowing yourself to have fun with it. Think of it as this is your private letter and you can say whatever you want in the letter. If you feel so inclined after you write the letter, send it yourself. Then when you get in the mail, you could be surprised when you receive it in the mail. The other thing that you could do with your letter, is put it in an envelope and put it some where safe and secure. Then after you finish the first draft of your novel, pull out the letter and read it, before you start reading that first full draft of your novel. While I have not yet written a letter for The Bird that Sings, I’m thinking of actually starting it very soon. As you write the letter remember have fun. You can be serious if you want but try to mix in that bit of fun. Also if you would rather, address the letter to a character in the novel and not the novel itself that is fine too. Just have fun and get some clarity with it. Take your mind off things and just write. I hope that you all have fun writing day as you continue on with NaNoWriMo! It’s day three of NaNoWriMo, and The Bird that Sings is at 8,065 words and about 11 pages. I’m so enjoying writing The Bird that Sings, I can’t tell you what it means to finally being able to get on the page. Oh, yes, I can! I’m super happy and excited at the same time. As we work on writing our first drafts during NaNoWriMo, we should all be super excited for whatever we are finally putting on the page. That is the topic that I want to take on, keeping the excitement going as you are working through NaNoWriMo or any writing project that you might be taking on. Granted, there are times, especially when we are in school where we don’t feel like writing or even a bit of excitement about the topic that we are tackling. But somewhere deep down there is a spark that we each reach for. It may be an initial spark or just one line that gets our writing juices flowing. This one line does not have the beginning sentence of the piece for it can be in the middle or the last line. But somewhere in there is a line that you are going to love with all your heart. That one line is going to be the piece that is going to knit and hold you to that piece. Whatever this one line is for you, don’t kill it. Make it stronger. The stronger the better. But don’t over do it. If you overdo the love that you have for this one line it is going to sink and then at which point you are killing that lovely darling. Granted, killing your darlings does not usually mean what I have stated above, for it usually means giving it the ax and deleting it. But I say like anything else on here, you can give the phrase killing your darlings a new leash on life. While, we can several darlings on the page, chose one that is going to be the one that you are never going to kill. This one is going to need you to protect it. You are going to be it’s strong willed champion. If you are not able to do that for that single darling then it’s probably not the darling that you are going to protect. I know it’s hard to kill that darling when it’s the thing that is giving you the excitement for writing this piece. But granted you won’t know its your darling until you get to the editing phase. When you get to the editing phase and you know that darling, highlight that sucker and keep it close. I would even say write it down and then write and think about why you are going to protect this one darling with everything that you have. Just as we eat, sleep, drink and think about writing, we should be doing the same thing with this one darling. While I said that you may not know who this darling is until you being editing, there are times when we writers know about this darling during the writing process. When we know this darling well during the writing process, then it can become one of many tools in our arsenal among others. But however you write it there needs something that makes you excited to continue on writing to gain that next page until you put down at the finish, The End. I hope that you are excited about your project for NaNoWriMo and I hope that you have a wonderful writing day! So I say onto you, Happy writing and happy creating!